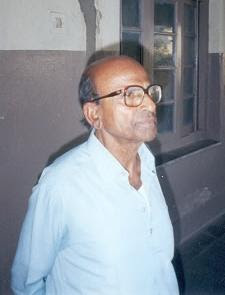 Comrade Kanu Sanyal, born in 1932, is an Indian communist politician. He is one of the founding leaders of Communist Party of India (Marxist-Leninist) formed in 1969. After the death of Comrade Charu Majumdar, Sanyal questioned the basic foundation of CPI (ML) and alienated himself from the so-called CPI (ML) groups. He is now general secretary of a new CPI (ML), formed by merger of several splinter groups of the original party. Comrade Sanyal has abandoned the violent and anarchist means of struggle, and accepted mass line and parliamentary practice, as a form of revolutionary activity. ok.. comrade snyal accepted his method was anarchist, apolitical was not having dupport from mass. Including sanyal and CPI[m-l] wrongly calculated there is a revelutionary situation in India in 1970s. Due to this they bypassed the parliamentally struggle and went ahead for the anhulling method. This was a wrong step and used by media, right wing parties against left. So this is a pleading to all ML groups and activists to stop this way and work for a broad left front against the right wing parties.